• For sensitive determination of NAD and NADH and evaluation of drug effects on NAD/NADH metabolism. • Sensitive and accurate. Detection limit of 0.05 μM and linearity up to 10 μM NAD+/NADH in 96-well plate assay. • Convenient. The procedure involves adding a single working reagent, and reading the optical density at time zero and 15 min at room temperature. • Pyridine nucleotides play an important role in metabolism and, thus, there is continual interest in monitoring their concentration levels. 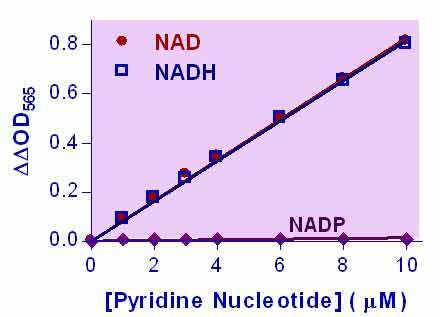 Quantitative determination of NAD+/NADH has applications in research pertaining to energy transformation and redox state of cells or tissue. Simple, direct and automation-ready procedures for measuring NAD+/NADH concentration are very desirable. BioAssay Systems EnzyChrom™ NAD+/NADH assay kit is based on a lactate dehydrogenase cycling reaction, in which the formed NADH reduces a formazan (MTT) reagent. The intensity of the reduced product color, measured at 565 nm, is proportional to the NAD+/NADH concentration in the sample. This assay is highly specific for NAD+/NADH and with minimal interference (<1%) by NADP+/NADPH. Our assay is a convenient method to measure NAD, NADH and their ratio. 1. When tissue is used, should it be freshly obtained? Or is -80?C storage ok? If direct sample processing is not possible, we recommend snap freezing tissue samples in liquid nitrogen and keeping them either in liquid nitrogen or at -80?C until further processing. 1. Bai P et al (2011). PARP-1 inhibition increases mitochondrial metabolism through SIRT1 activation. Cell Metab. 13(4):461-8. Assay: NAD/NADH in Mouse cells (Pubmed). 2. Clem B et al (2008). Small-molecule inhibition of 6-phosphofructo-2-kinase activity suppresses glycolytic flux and tumor growth. Mol Cancer Ther. 7(1):110-20. Assay: NAD/NADH in Human epithelial cell (Pubmed). 3. Kim Y et al (2008). Dihydrolipoamide dehydrogenase mutation alters the NADH sensitivity of pyruvate dehydrogenase complex of Escherichia coli K-12. J Bacteriol. 190(11):3851-8. Assay: NAD/NADH in Bacteria E.coli (Pubmed). 4. Song HK et al (2008). Visfatin: a new player in mesangial cell physiology and diabetic nephropathy. Am J Physiol Renal Physiol. 295(5):F1485-94. Assay: NAD/NADH in Human mesangial cells (Pubmed). 5. Greenall A et al (2008). A genome wide analysis of the response to uncapped telomeres in budding yeast reveals a novel role for the NAD+ biosynthetic gene BNA2 in chromosome end protection. Genome Biol. 9(10):R146. Assay: NAD/NADH in Yeast cell (Pubmed). 6. Thornburg JM et al (2008). Targeting aspartate aminotransferase in breast cancer. Breast Cancer Res. 10(5):R84. Assay: NAD/NADH in Human breast adenocacinoma cell (Pubmed). 7. Hsu CP et al (2009). Nicotinamide phosphoribosyltransferase regulates cell survival through NAD+ synthesis in cardiac myocytes. Circ Res. 105(5):481-91. Assay: NAD/NADH in Mouse heart cardiac myocytes (Pubmed). 8. Olesen UH et al (2008). Anticancer agent CHS-828 inhibits cellular synthesis of NAD. Biochem Biophys Res Commun. 367(4):799-804. Assay: NAD/NADH in Human cell (Pubmed). 9. Tseng HC et al (2009). Metabolic engineering of Escherichia coli for enhanced production of (R)- and (S)-3-hydroxybutyrate. Appl Environ Microbiol. 75(10):3137-45. Assay: NAD/NADH in Bacteria E.coli (Pubmed). 10. Lee M et al (2010). Depletion of GSH in glial cells induces neurotoxicity: relevance to aging and degenerative neurological diseases. FASEB J. 24(7):2533-45. Assay: NAD/NADH in Human cell (Pubmed). 11. Koo BS et al (2010). Improvement of coenzyme Q(10) production by increasing the NADH/NAD(+) ratio in Agrobacterium tumefaciens. Biosci Biotechnol Biochem.74(4):895-8. Assay: NAD/NADH in Yeast Agrobacterium tumefaciens (Pubmed).